An Archaeology of Art and Writing offers an in-depth treatment of the image as material culture. Centring on early Egyptian bone, ivory, and wooden labels—one of the earliest inscribed and decorated object groups from burials in the lower Nile Valley—the research is anchored in the image as the site of material action. A key aim of this book is to outline a contextual and reflexive approach to early art and writing as a complement to the traditional focus on iconographic and linguistic meanings. Archaeological and anthropological approaches are integrated with social theories of practice and agency to develop a more holistic perspective that situates early Egyptian imagery in relation to its manufacture, use and final deposition in the funerary context. 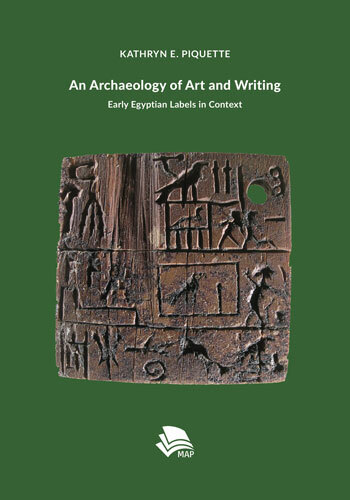 The dialectical relationships between past embodied practitioners and materials, production techniques, and compositional principles are examined for the insight they provide into changes and continuities in early Egyptian graphical expression across time and space. The electronic version of this book is accompanied by an online database of the inscribed labels, enabling the reader to explore via hyperlinks the fascinating body of evidence that underpins this innovative study. Kathryn Piquette lectures on the archaeology of ancient Egypt and the Near East at the University of Reading. She also lectures in digital humanities at University College London, where she serves as a senior research consultant in advanced digital imaging techniques for cultural heritage. Recent publications include the co-edited Writing as Material Practice: Substance, surface and medium. This book has been peer reviewed. See our Hier finden Sie mehr Informationen zur wissenschaftlichen Qualitätssicherung der MAP-Publikationen.